"If at first you don't succeed..." I think all of you know how this phrase continues. 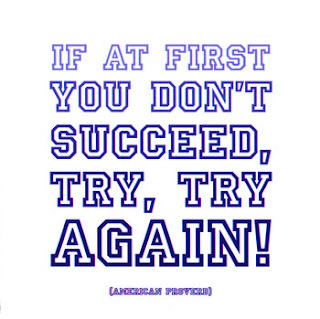 At some point in time as children, we all heard our parents tell us to "try, try again." At school, we often find ourselves saying, 'Just give it another shot', 'Keep trying and you'll improve', 'Just stick with it and you'll make it happen' and 'Even if it's late, it's still important you do the work'. We say these words to inspire students to perservere at whatever challenge, goal or task it is that lies in front of them. By saying these phrases we acknowledge that students don't always learn things the first time, that they will make mistakes and most importantly, that with continued practice they will improve their learning. We also make these statements because we believe the work is important to student learning and therefore, insist that students complete the work. So this leads me to my big question. Do your classroom practices support these ideas? Do you allow students multiple opportunities to demonstrate their learning or do you allow for only one opportunity, forcing them to learn concepts by a certain time? Do you provide opportunities for students to make and learn from their mistakes or do you punish students for taking risks and making mistakes, leading to the erosion of student confidence? Do you incent students to continue practicing in an effort to improve their skills or do you shut the door to practice by penalizing students for not learning on time? 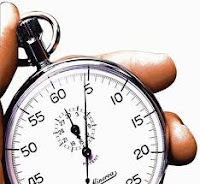 Do your insist that the completion of work is more important than its timely submission? 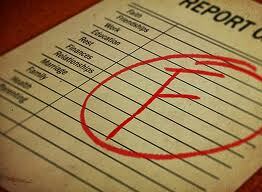 Do you assign a mark of zero when a student fails to complete work on time? If so, regardless of whether a student didn't understand how to complete the work or the student didn't bother to do the work, you have likely put an end to the learning. A zero signifies a sense of finality and as such, when a student receives a zero, he/she sees no reason to complete the work. That means that the student who didn't understand how to complete the assignment is being punished for not understanding or learning 'on time'. And the student who was lazy or forgot to complete the assignment is being let off the hook. He/she now has an excuse for not completing the work...a zero! Assigning a zero for work not submitted on time also implies that you place greater value on the timely submission of work than the thoughtful completion of work. Basically, the questions you should ask yourself are 'Is it better for a student to complete work but hand it in late, or not complete the work at all?' and 'Is it better for a student to put effort into their work and submit it late, or hastily complete the work and hand it in on time?' If the work you have assigned is important to student learning, I believe that the timely submission of work, while ideal, is less important than ensuring students actually complete the work to the best of their ability and advance their learning. Do you deduct marks for late work? If so, you are using 'carrots' and 'sticks' in attempt to alter behavior. The threat of having marks deducted for failing to submit work on time may create enough pressure that some students complete the work when they might not have in absence of the threat. These threats might provide extrinsic motivation for students who are quite capable, understand the course content and are 'marks-driven'. They may force themselves to rush and finish their work, but they likely won't submit their highest quality work and won't be maximizing their learning. Now consider the struggling students and slower learners. The threat of a late penalty may crank up the pressure they feel, but it isn't likely to alter their behavior. Even if they have the best of intentions to complete their work on time, their lack of understanding may prevent them from doing so. What is your balance between formative and summative assessment? Do you mark everything that students do? If so, you tend to emphasize summative assessment. Do you offer lots of descriptive feedback instead of marking most things? If so, you tend to emphasize formative assessment. Marks may make students do more, but marks won't make students do things better! Whatever the reason, many educators have fallen into the trap of thinking that everything a student does must count for marks. As a result, students are driven by marks instead of driven by learning. If our goal is for students to comply by handing in work, then extrinsic motivation such as marks might result in some success. But if our goal is for students to be thoughtful about the work they do and maximize their learning, then offering feedback and creating opportunities for improvement are critical. Work can still be important and students will still complete work even if a mark isn't attached to it. Students require the opportunity to practice developing and refining new skills and interacting with new content without the pressure of being graded. The focus for students and teachers should be on learning rather than accruing marks. Instead of penalizing students for incomplete and incorrect work, teachers should focus on supporting students and offering them descriptive feedback that will help students move their learning forward. 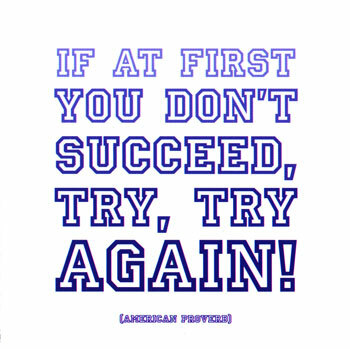 So, as you reflect on how your students are performing, I urge you to consider whether your practices encourage or discourage students from 'trying again if at first they don't succeed'!